Want to do some plinking and maybe even some hunting…but not with a firearm? Many gun owners are used to thinking of air rifles as toys…but modern air rifle technology is far from what your grandfather found under the Christmas tree when he was a boy. He’d be shocked with what he could do accomplish using modern airguns. That’s right, you can even hunt some larger game — such as small deer — with today’s big bore airguns. And because air rifles aren’t classified as firearms, in most areas you don’t have to go through a background check or waiting period to pick up your gun. There are so many options available, it’s nearly impossible to say what the “best” air gun is for any given application. If you’re a beginner, you probably want a smaller caliber, simpler and less expensive air rifle to plink with and maybe even do some varmint hunting or pest control. If your budget and skill level allows, you might step up to a larger caliber or a more sophisticated power plant — there are a variety of methods used to propel slugs, pellets, and BBs in modern air guns. But if you really want to do some long range shooting or have a shot at taking anything up to a small deer, you’ll probably want to pick up a “big bore” air rifle in .45 or .50 caliber. .50 Cal HP Air Rifle Pellet, 185gr. Roughly the same weight as a .40 SW bullet. Rather than try to run through all of the possible options, let’s take a look at a few quality air rifles for a variety of applications, and see if we can’t surprise you with what these guns can do. Keep in mind, these weapons are not toys and are meant to be used in serious hunting applications or for responsible plinking. There is a dizzying array of air guns for beginner shooters, and we’ll take a look at a couple that would suit someone with less experience, but who still wants a gun that can serve effectively in a variety of applications. These rifles are usually available in .177, .22 and .25 calibers, which are the more traditional calibers for airguns. Soft shooting, simple to use, great for beginners of any age. This is a great option for those seeking a quiet air rifle in .177 or .22 caliber. Newer air rifle shooters will like the Mach 1’s ease of use and simplicity. To operate the rifle, you just pull the barrel down, breaking it open, put in a pellet, close the barrel, and you’re ready to go. This model operates with a gas-powered piston, so instead of compressing a spring, you’re using compressed gas to power the gun. This has several advantages, including less weight, noise, and vibration, and offers the ability to leave the rifle cocked for long periods of time. In addition to Gamo’s Whisper noise-reducing system, the break-barrel Mach 1 features a synthetic stock, two-stage trigger, integrated iron sights and a scope. It also comes with a buttstock pad, but the recoil is already minimal, and most shooters won’t have a problem handling the rifle. Regarding the 3×9 scope included with the gun, many users complain it isn’t up to snuff – but since this is a beginner’s air rifle, that shouldn’t be shocking. 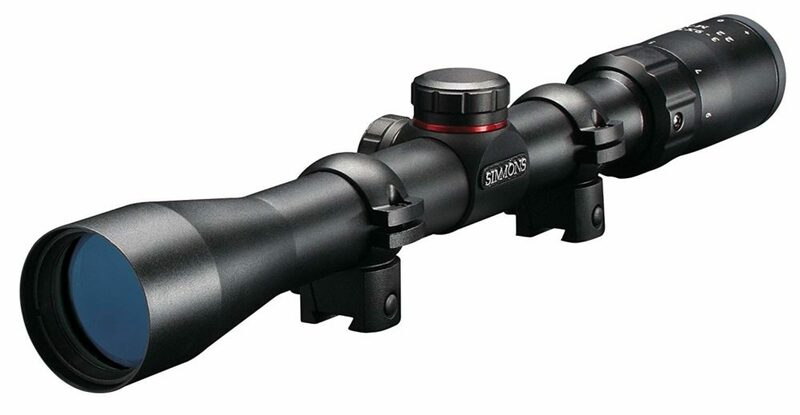 One of our editors replaced the original scope with a Simmons Truplex .22 Mag 3-9×32 scope and loves it. The rifle is accurate out to around 100 yards or more, and the open sights will serve at this range, though if you’re hunting small game, you’ll probably want to use a better scope to ensure accuracy. Another break-barrel air rifle, the NP XL feature’s Benjamin’s Nitro Piston power plant, a gas-powered piston system that Benjamin pioneered. Easy to shoot and benefits from all of the features gas-powered pistons offer air guns, including low noise and vibration, low recoil, and the ability to leave the rifle cocked for longer periods. You’ll find it available in .117, .22 and .25 calibers, and is accurate out to around 100 yards. A baffled barrel is an added plus helping to quiet your shots while the wood stock adds a more traditional look to the rifle. It also comes with a 3×9 scope that is adequate, but some will want to replace it with a more capable after-market model. The option to pick up this rifle in .25 is very nice, though this caliber is somewhat more divisive because the larger pellet size takes more pressure to reach usable velocities. You can even take slightly larger varmint species ethically with these calibers, provided you’re well trained and know how to place your shot appropriately. What’s your take on the NP XL? If you’re an experienced shooter or you need something with more punch, you might want to consider stepping up to pre-charged pneumatic (PCP) air rifles. These systems are more expensive but can achieve substantially greater energy output, making larger calibers viable in an air gun platform for the first time. Since these sport larger bores, they are generally called “big-bore” guns and can shoot all the way up to a .50 caliber special slug. This single-shot precharged pneumatic air rifle pushes a .50 caliber slug at around 650 feet per second. That’s a lot of punch. The charging handle sits on the right side of the gun, and each slug has to be hand-loaded and the handle pulled back to ready the gun to fire. The tank sits underneath the barrel and can be filled from a tank of compressed air at the appropriate PSI, or with a special high-pressure hand pump, though this can be a serious workout. A full tank will deliver between 8 to 10 shots depending on a variety of factors. Be aware, however, that the gun doesn’t automatically regulate pressure — there is a selector to toggle between “low” and “high” pressure to adjust air output depending on the target — and as you shoot, your velocity will drop. With a wooden stock and blued steel, this is a high-end option for someone looking for a PCP rifle that’s appropriate for taking medium-sized game, and even small deer if you’re experienced and confident in your ability. While you certainly could have fun plinking with it, it’s really designed more for serious hunting applications. At this price point, you’ll likely want to put it to use. Though PCP air tanks can be difficult to refill in the field, especially if you’re out hiking all day, the Dragon Claw is a more than capable air rifle. It has another special feature, as well: you can fire the specially made Air Venturi Air Bolts — they look like a cross between a crossbow bolt and an arrow — out of the rifle’s barrel, essentially making the Dragon Claw a dual-purpose rifle. With improvements in air rifle technology, big bore guns have become totally viable options for those seeking a weapon that can actually perform in the field. The Texan and Texan SS are PCP-powered .45 caliber big bore options for those who want a lot of power in a portable and convenient platform. Because these big bore airguns are pushing a lot more pressure, they tend to be louder, and the SS model features a fully shrouded barrel to seriously dampen noise output. These rifles are accurate and definitely capable of taking a small deer within appropriate range. Perfect for a property with adjacent neighbors and you don’t want to bother them with your shooting, the SS is an excellent option for hunting or just plinking. This is another PCP air rifle with some innovative features and customizability from Crosman. The rifle is formatted in the bullpup layout, meaning that the barrel runs almost the entire length of the gun. As with real bullpup firearms, such as the IWI Tavor or Kel-Tech RDB, this helps keep the rifle compact while retaining the velocity necessary to push the .357 slug out with impressive energy. What’s different about this gun, though, is its integrated 5-round rotary clip and it’s fully shrouded barrel. This is a quiet air rifle and a relatively light air rifle, and you will probably go through quite a few slugs and air fills before you’ll be willing to quit shooting. It’s well suited for quiet hunting as well, and is suitable for medium-sized game, though there may be better options for deer. These are just a few of the air rifles I like, and tons of excellent alternatives are available, with more coming out all the time. Newer designs, such as gas-piston and pre-charged pneumatic systems, have changed the game in the last few years, and who knows what new developments will emerge to change the landscape further. There’s an air rifle platform for almost any application and budget, and I think in many cases they have surpassed traditional firearms, such as for certain varmint control situations and discreet plinking. Best of all, these guns are plain fun to shoot. If you’re looking to get your start this hunting season, our Introduction to Deer Hunting article is a great place to start! I’m sure you can think of other uses for air rifles, so let us know what you think of the options we’ve highlighted. Check out the rest of our guns & gear in Editor’s Picks. The post 5 Best Air Rifles for Plinking & Hunting [All Budgets] appeared first on Pew Pew Tactical.